I had no updates. I had no words. I had nothing to give to you today, audience. I barely did anything last week that couldn't be condensed down to: didn't get off the computer, didn't craft much, didn't do anything new, didn't do much at all with sewing or knitting. The problem with working on large cross-stitch projects or long in the round scarves is that even when you manage to make a few hours worth of work on them, it's still 'ho hum', you know? And with Nathan being suddenly the world's worst sleeper this week, I haven't gotten any sewing done either. I'm not motivated to sew and, if I do sew, the machine is loud enough to set him off. I was pretty depressed about having no updates and considered not updating my blog this week, pretending the whole week had not occurred. I was at my mom's today, thinking about this, and how it sucked, I got kind of whiny with my mom. (Not that my mom doesn't have her faults, but she did not deserve the attitude today.) When she was sitting there with Nathan, I passively-aggressively asked if she was ever going to put any of the cross-stitch I made for her up on the walls. Or did she just lose the cross-stitch that I did for her at her request? The set that took me ten years to complete? Did she just lose it. My mom looked at me, a bit shocked, because she had forgotten about them. She said to me, "Well, my house is done. I should put them up. It'll cost too much to frame them." I told her to just put them on the floor, and I'd photograph them. Readers, I'm going to dole them out to you when I have nothing else to show you. That's how I roll. I'm willing to take old projects and make them NEW. So, going back in the day, here's a cross-stitch I completed when I was 19, back when I was ambitious and willing to cross-stitch everything. This is not part of the previously mentioned set. 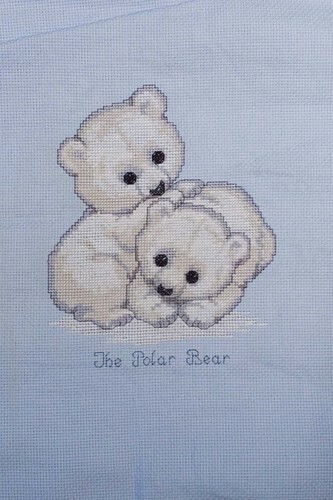 This is my baby polar bears cross-stitch. The cloth is some type of aida, but I don't know what size (14, perhaps). As for my sewing, well, I did cut out some stuff for the cloth book my mom wants me to make for my cousin's child. 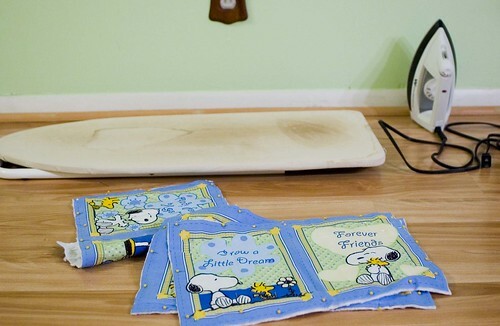 Isn't my mini-ironing board cute? That's also my crap iron that I love more than I used to love it because at least my crap iron didn't melt my sewing thread like my mom's scary iron of doom did. How are you guys doing? Getting stuff done? I'm not going to make any firm plans for the upcoming week. If I can sew, I will. If I can't, I won't. If I get nothing done at all, I'm going back to truly firm planning.